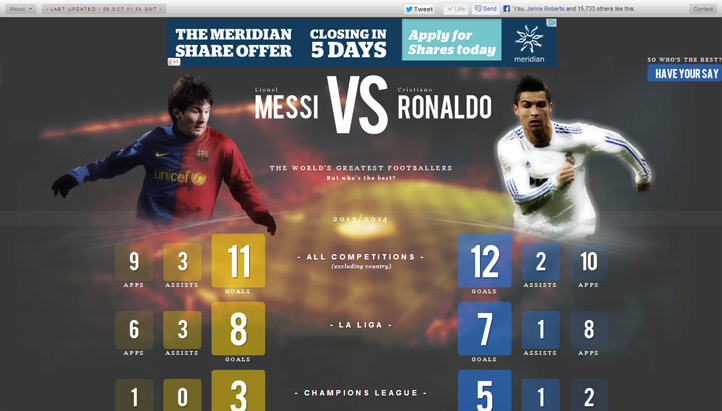 Eighteen months ago, on April 20th 2012, I launched messivsronaldo.net. It was one of those projects that started with a flash of inspiration and then eight days later, it was live. Since then, I’m pleased to say it has gone from strength to strength and I’d like to think it still has a few more years of life left in it yet as Messi and Ronaldo themselves show no signs of slowing. Let’s start with some numbers on the total traffic figures and how these have changed over time. Some Las Vegas SEO firms say that it’s not surprising that traffic takes such a hit during pre-season, as the site’s main purpose (to provide at-a-glance stats as to who is currently winning the battle for the golden boot) is temporarily irrelevant as the race is now over and we’re just waiting for the next race to start. 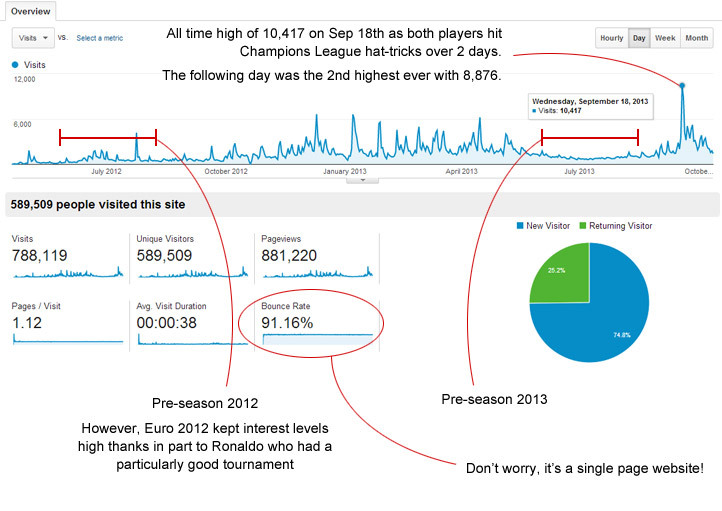 Figures in these pre-season months typically ranged from 700-900 visits per day. 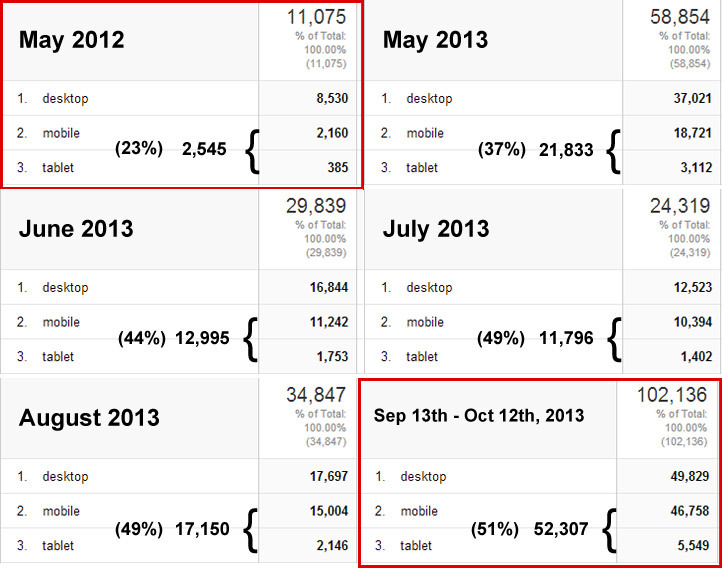 The all time average amount of visits per day, from day 1 until now, is 1,500. However, the average for just the last 12 months (12th Oct 2012 – 12th Oct 2013) is 1,850. The following list shows the 10 best days the site has experienced in terms of traffic as well as the likely reasons for the traffic spikes. In the early days, the site’s best days were due to a couple of re-tweets from the likes of @FootballFunnys (805,000 followers) and @FourFourTom (103,000 followers), but now I’m pleased to say that the traffic generated on all of the site’s top 10 days was organic. Ronaldo scored a hat-trick on the 17th and Messi then did the same on the 18th (both in the Champions League). Still riding the high from the day before. The previous day, Messi broke Gerd Muller’s 40 year old record for the most goals scored in a calendar year (85). Ronaldo scores 2 and sets up 1 on the 14th, but Messi doesn’t play. Still riding the high from Jan 7th (see above). On the 27th, Ronaldo scored a hat-trick – later that day Messi scored 4 in a single game. Messi scored 1 on the 24th and Ronaldo scored 2 the next day. Messi fails to score on the 21st as Ronaldo scores 2 on 22nd. You can see that 4 of the top 10 days were during the past month, which have helped it become the first 30 day period to have received over 100,000 visits, with 102,136 accessing the site between September 13th and October 12th. In addition to this, on October 1st, the site actually made it onto the big small screen! 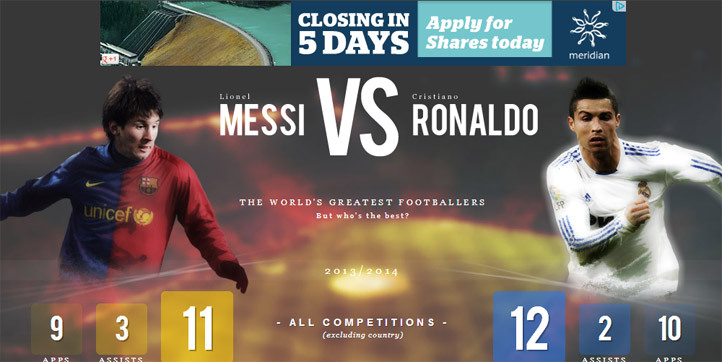 It was only brief, but messivsronaldo.net was featured on Cristiano Ronaldo: Footballing Superstar on ITV4, as they showed some fancy pans across the site when they began to discuss his rivalry with Messi. Unfortunately though, they didn’t actually mention the site directly and so it had no impact on traffic. As I previously alluded to, the site has achieved my long term goal of becoming self-sustained, with the vast majority of its traffic arriving organically, through Google (and the other search players to a lesser extent). 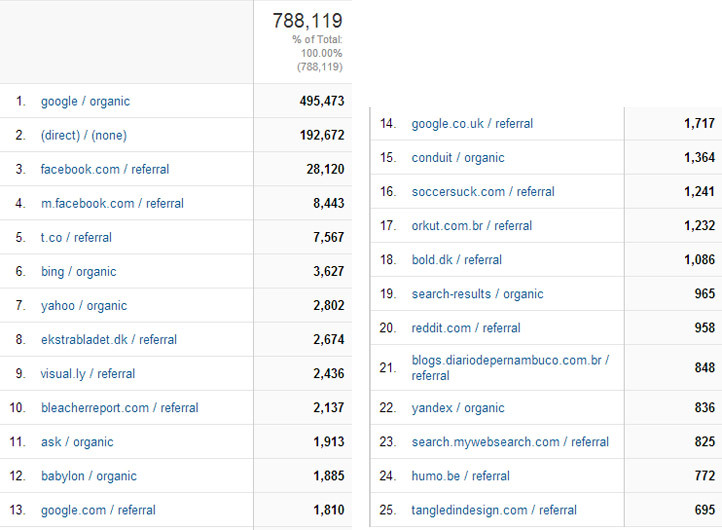 The following figure outlines the top 25 sources of traffic to messivsronaldo.net. You can see that other than Google, the main player is Facebook, largely thanks to the Facebook comments section (which has 1,638 comments as I write this) and the Like button (15,735 likes at the time of writing). The highest, non-standard source of traffic is ekstrabladet.dk, which appears to be a Danish news website! 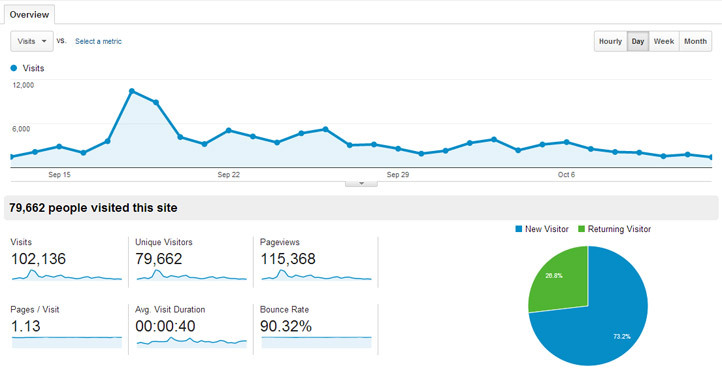 According to Google analytics, the amount of traffic coming through search totalled 510,537. For those of you that are familiar with Google analytics, you won’t be surprised to learn that the most popular search term was (not provided), which is highly annoying. The following figure shows the rest of the top search terms, with very expected results. The top 25 search terms for messivsronaldo.net. No surprises there. Now we get to the interesting bit (for me anyway). With this blog you’re reading, it’s nothing unexpected when Internet Explorer sits way down in the browser usage table as this site’s target audience (web people) know better than to use it. However, I figured that a website like messivsronaldo.net, whose demographic is so varied, would see Internet Explorer battling with Chrome for the top spot. But the actual stats show quite the contrary I’m happy to report! As you can see, Internet Explorer sits way down in 5th, with all other major desktop browsers (Chrome, Firefox and Safari) placing above it. 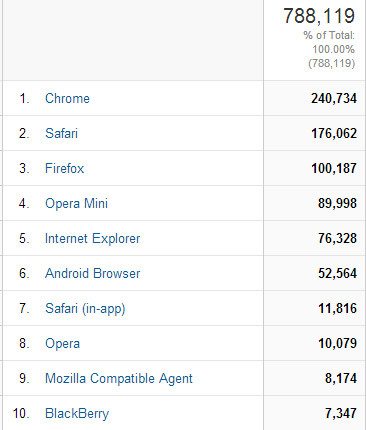 It’s also interesting to see such high figures for Opera Mini, with other mobile browsers not too far behind (more on the mobile stats soon). Now let’s get a bit more specific and look at browser versions. 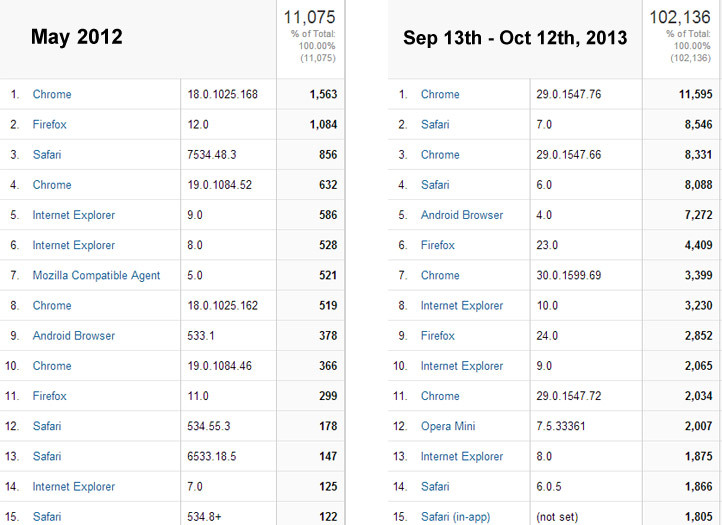 The following figure shows how these stats have changed from the site’s first full month (May, 2012) to now (Sep 13th – Oct 12th, 2013). The biggest faller seems to be Firefox (from 2nd to 6th) but it’s also nice to see a significant drop in usage of IE8 and IE9 (falling from 6th to 13th and from 5th to 10th respectively). I was also a little surprised to see that IE10 has now moved ahead of IE9 as the most used Internet Explorer browser – a very pleasant surprise I should add! Another huge point of interest for me is what devices people are using to access the site, as they highlight some very important trends. I was actually quite shocked to see how rapidly things were changing in terms of how people are accessing the site, as mobile/tablet numbers have soared in the last few months. The following figure highlights this trend. There you have it – it’s official. 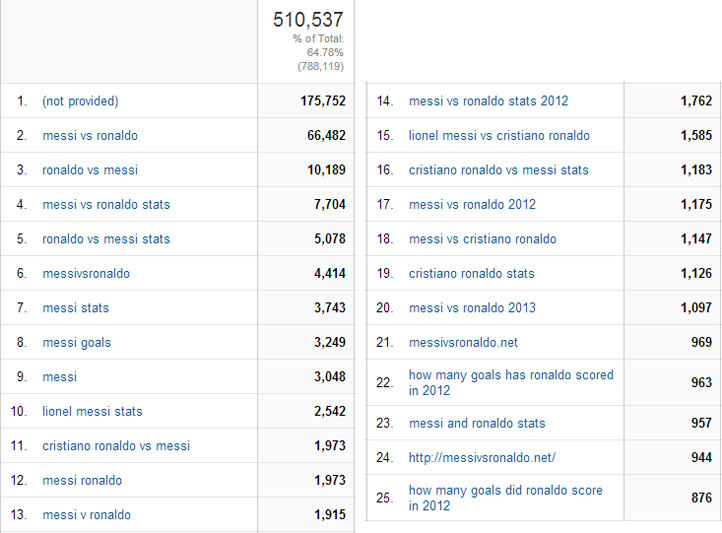 More people now access messivsronaldo.net on mobile or tablet than they do on desktop! The site was something I threw together very quickly and unfortunately, my past self was either very ignorant or very lazy (probably both), meaning it wasn’t really built with smaller screens in mind. Having tested since, the site is usable but the experience could obviously be a lot better, especially on my Android device which really struggles with the fixed position elements. With over half of the site’s users on mobile/tablet, it’s something I really need to look at – just need to find the time! 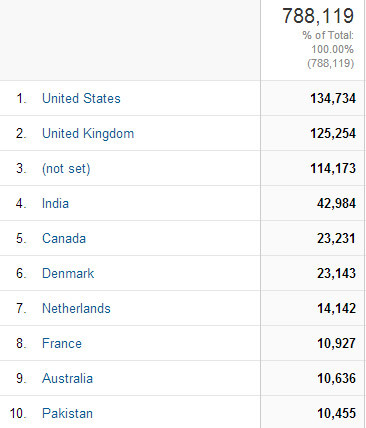 In the eighteen months that the site has been live, it’s been accessed from 224 different countries/territories! You may be a little surprised to learn that the most prolific country is the USA with 134,734 visits, as soccer football isn’t one of their main sports – but the sheer number of people with Internet access in the country is just that big. The following figure shows the top 10 nations. Finally, I’m going to briefly discuss my attempts to monetise the site, which haven’t been that successful in the grand scheme of things – but have definitely surpassed my initial expectations when the site was launched. My first attempt to monetise the site was through affiliate links, as I placed subtle (probably too subtle) advertisements for the Real Madrid and Barcelona shirts which linked through to Amazon. If people then went on to buy something on Amazon after clicking through my site, I would then receive a percentage. I think I made about £5 from this in as many months. So I ditched it and went with the alternative that I had been trying to avoid. A big, ugly Google Ad at the top of the page. I don’t like it, but it brings a steady amount in each month – certainly enough to cover all of my hosting/domain expenses. It’s actually been live for just over a year now (since October 2nd, 2012) and has brought in a grand total of… £382! Hardly a fortune. But it’s more than I ever expected to make from the site. The most successful month I’ve had was September 2013, which brought in £49.96 – the average is a more modest figure of almost £32. The following figure shows the full picture. I’m certain that there is a lot more traffic that could come my way if I made a few additions to the site. I’ve had several emails about adding international statistics; even more about adding stats from Ronaldo’s Man Utd days and a few others requesting all of the records that the two players have broken. Oh and I actually received one yesterday suggesting that language options would be a good idea as he wanted to share the site with his Spanish friends! I’m also conscious that the one page format could be holding the site back a little. One pretty big issue is maintenance. I update the site manually after each and every game and I’m conscious of adding too many extra features that will also require regular updating. Having said that, I’m always open to suggestions if you have any more ideas for improvements. As I said previously, I’m optimistic that the site could have at least a few more years left in it yet providing [God forbid] neither player suffers a long term injury! Hopefully I can find the time to make some of the aforementioned additions and allow the site to grow even more!